Saffron has a history of being a medicinal plant. In fact, the saffron plant has been scientifically proven to prevent the formation of certain cancer cells. In addition to this, it is also known to provide protection against mutations, boost the immune system and also to act as an antioxidant against harmful elements that could harm our body. 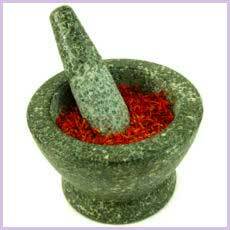 Saffron is also capable of relieving stress and both physical and mental pain. And because saffron has a stimulating effect on our body, it also has the capability to increase urination and lead a person to a seizure. Pharmacological findings have shown that the intake of saffron can slow the progression of Alzheimer's disease. Everyday pains and complaints like an upset stomach or coughs, saffron can help eliminate the problem. It is because of the unique modes of action of saffron that causes this plant to cure or temporarily aid a variety of sicknesses. Saffron has no distinct side effects rather than on pregnant women. In regards with its capacity to help obesity, there has been a lot of debate going on whether the latter claim is true. Researchers, who claim saffron to be able to help 'slim' obese people down, revealed a certain element in saffron named 'Satiereal'. This psychoactive substance is known to 'lift the spirits'. And for someone who retains a good and well-balanced humor, one will not be tempted with any cravings.